The foods you put on your plate make a difference in your health. One way they do this is by influencing your blood sugar levels, an effect that is particularly important for people with diabetes. The American Diabetes Association recommends that your blood sugar levels stay between 70 and 130 mg/dL before you eat and that they do not exceed 180 mg/dL in the two hours after meals. Understanding how starch converts to sugar can help you make better food choices for optimum diabetes management. 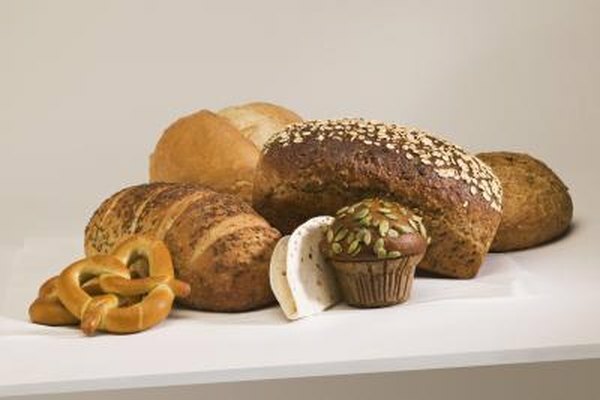 Starch, in addition to sugar and dietary fiber, make up the total carbohydrate content of a food. Although the starches are usually not listed on food labels, you can figure out the amount of starch in a food by subtracting the sugar and fiber from the total carb content. For example, a slice of white bread with 14.7 grams of carbs, 0.7 grams of fiber and 1.3 grams of sugar contains 12.7 grams of starches. Starches are actually made of glucose, the same type of sugar you have circulating in your blood. The molecules of glucose in starches are linked together by bonds that are easily and quickly broken by the enzymes of your digestive system. In other words, when you eat starchy foods, they are converted to glucose, a type of sugar, which is then absorbed in your blood. The more grams of starch you eat, the more sugar and glucose will be produced in your gastrointestinal tract and absorbed into your body. Whether you have diabetes or not, the starches you include in your meals or snacks will be converted to sugar. All starchy foods can raise your blood sugar levels, but everybody responds differently. If you have diabetes, your blood sugar levels will raise more or less when eating starches depending on the medications you use and the presence of insulin resistance. Your blood sugar levels will raise even higher if your meals contain sugar in addition to containing starches. Your carbohydrate intake, which includes both starch and sugar, is the main factor in determining how a meal will influence your blood sugar levels. If you have diabetes and measure your blood sugar levels yourself on a regular basis, you are aware that the carbohydrate content of foods is the main factor influencing your blood sugar levels. In addition to the amount of carbs you eat, which include both starches and sugars, the glycemic index can make a difference in your diabetes control. Many diabetics wrongly believe that starchy foods, such as bread, potatoes and pasta, do not raise blood sugar levels as much as sugary foods, such as sweets and desserts. However, the glycemic index of starchy foods -- especially refined grains and potatoes -- is as high as most sugar-containing foods. To keep your blood sugar levels under control and stay healthy with diabetes, pay attention to your starch and total carb intake.